To close off my little series of posts on Halloween, I'm going to end it with two things. The first is a review, and the second is a small reveal. Darkest of Dreams is a short story collection cobbled together by four different writers of Horror tales that span across the spectrum. As I've said, I don't read much Horror. It's not so much due to lack of interest in the genre, but for why I read scarier stories. Most Horror I've come across doesn't go for what I'm interested in. There's the border between life and death, eternity and the unknown, horrors that want the soul more than blood, and the terror of inevitable decay of the world to sin. It's that relationship between the natural and the supernatural that fascinates this reader. Duality and clashing sensibilities make for great stories, but they make for great Horror tales as well. That is why H.P. Lovecraft and Clark Ashton Smith's tales resonate so much with readers even so many years later. This collection, containing four writers with different ideas of Horror helps scratch that itch. 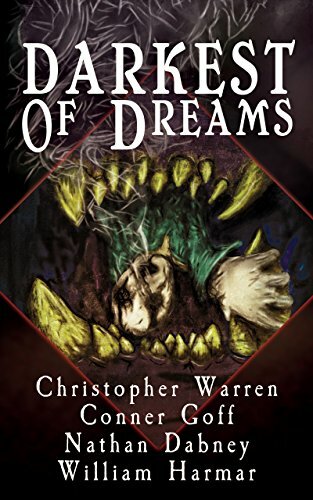 Christopher Warren's stories are more psychological, Conner Goff writes yarns about those slowly awakening to the strangeness around them, Nathan Dabney's tales are somewhere between Robert E. Howard and Lovecraft, and William Harmar's entries are like short character pieces divorced from a larger narrative. Each writer has something different to add, making this collection well worth reading for general Horror fans. There are similar approaches between some of the stories, but each brings out the character of the author enough that none run close to the other. Personally, I enjoyed Nathan Dabney's stories the most as they were action horror tales, and one of which includes a mysterious rough traveler with a heart of gold: the sort of story I never get tired of. 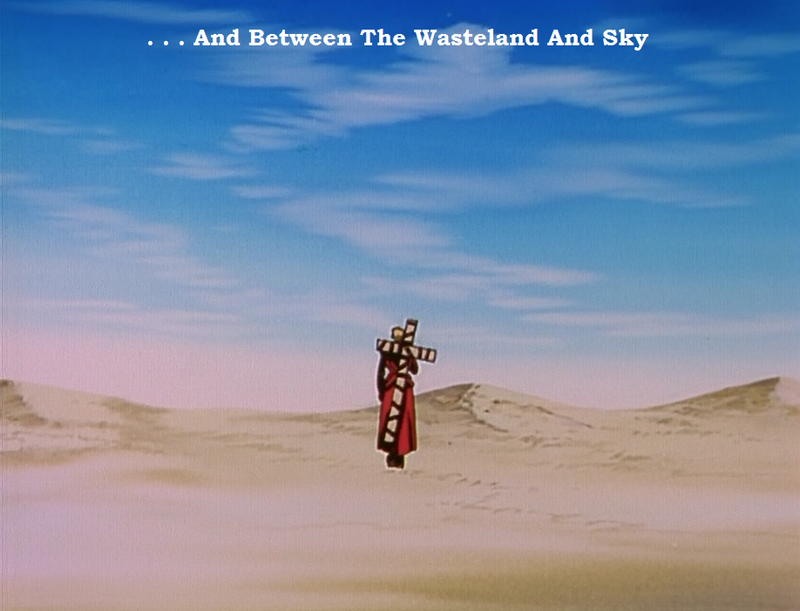 My least favorite is easily the final story that feels interminable and takes far too long to get to the point. But that is the only story I just could not get into. If you're a Horror fan, or just looking for some eerie reads, this is the collection for you. Be sure to give it a chance. In other news, I promised.I was working on a non-writing project for awhile now, and I have been. I wanted to reveal it sooner, but couldn't find the right opportunity. I've been working on a podcast with a friend of mine called Cannon Cruisers. It's a series where we spend 10-15 minutes each week talking about a movie from the Cannon Films catalog. We're more or less going chronological from 1980's Schizoid up until Cannon finally closed its doors in the early 90s. We're doing this for several reasons. The first is that neither one of us has seen as much 80s films as we would have liked. I also wanted to chart the change in 1980s pop culture, and no film company best illustrates how things changed so much than Cannon Films did. Mostly we just wanted to do a fun little project we could do on the side. Modern films are also not very good. I've only seen a grand total of two movies in cinema this year, and only one of which I later bought on DVD. This gives me an excuse to watch something that can hold my attention and fire up the imagination. And maybe it'll do the same for you, too. We're currently on episode 8, and have just completed our super-long and unedited Halloween special. If that is too much, just check out one of the shorter episodes instead. We release one episode a week, usually on Sundays, on soundcloud and our blog, and later on vid.me when one of us has some extra time. Please check us out if that's your sort of thing. And that's it for my series of Halloween related posts. I hope you had fun. Until next year, keep it spooky. You can get it Here, or for free by signing up for the PulpRev newsletter at scoop@pulprev.com! Hot off the presses, here's another new anthology that I am part of. A few months back pulprev.com put out a call for submissions for really, really short (we're talking under 2000 words short) stories. I put in my short called Lucky Spider's Last Stand, and it was accepted. My story is about a mobster named Spider who is dealing with his world crashing down around him. He faces down a monster of a vigilante who is dead set on doing him in. This tale is about the final moments of a criminal with more luck than sense. Putting this story together was different than usual for me. I had a seed of this one in my head for awhile but never had the opportunity to write it down. When submissions for this anthology came up, I used it as an chance to write and submit at pulp speed. It was a first for me. I sat down, wrote it up, edited it, and submitted it, all in a few hours. 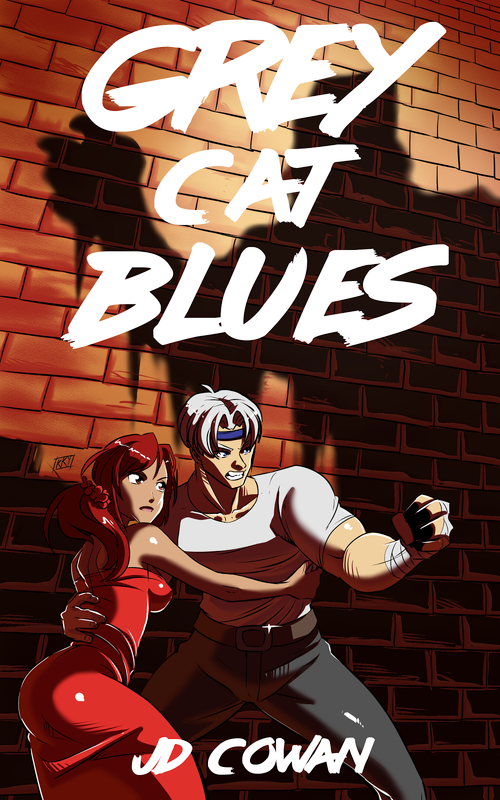 I wanted to embody the pulp spirit with every aspect of submission, and, thankfully, it was accepted! Other than a few line and clarification edits, this story is largely the same as it was when I put it through at pulp speed. So do me a solid, sign up for the newsletter (put "Subscribe" in the subject line), and give it a read. I'd love to know what you think. And read the others, too. 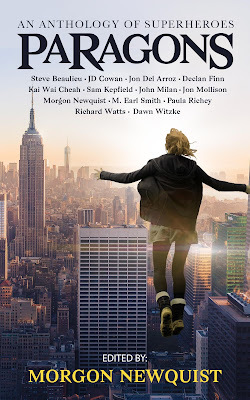 There are some killer writers in this anthology, and I'm beyond delighted to be included with them! I'm happy to announce that my story "Under Suspicion in Summerside" will be part of the upcoming superhero anthology Paragons by Silver Empire. 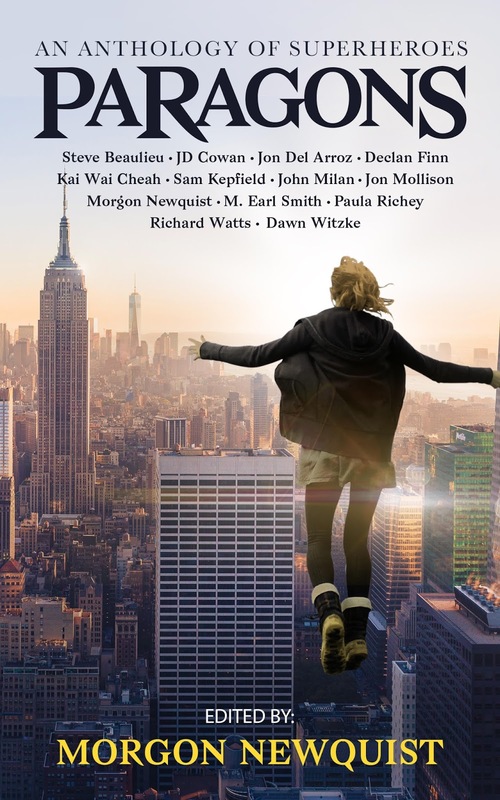 I'm particularly excited as I am a fan of many of the authors included within and am excited to read the stories from the ones I am unfamiliar with. Superhero stories in novel and short story form are not as common as you would think despite the genre's current popularity level. Silver Empire gathering a bunch of us together like this is a real treat both for me as an author and as a reader. Under Suspicion in Summerside is about a pair of heroes named Flatline and Concrete who arrive to foil a bank robbery from a man with exploding skin and his cronies. While this is going on, two civilians ponder if true heroes still exist or if they really have died off long ago. This was a fun story to write. There are four types of powers in the story. Physical types are those with naturally enhanced physical attributes like super strength or speed. Mental types deal with the mind and are the rarest type of power. Elemental types are those with mastery and control over specific elements like metal or electricity. The last kind, Abnormal types, deals with inexplicable abilities that cannot be categorized such as exploding skin. Even with the categories, those with powers are still a smaller percentage of the known population. This isn't an X-Men situation: those with powers are employed as little more than legal enforcers for the law. At least, that concerns those with known abilities. Heroes who operate illegally as vigilantes are known as Crusaders for their reputation as those who will do anything to stop evil. They're controversial, but not without their admirers.These two types of heroes are what my stories in this series revolve around. I've written a few short stories around the city, Summerside, and have started a short novel as well. The tales all tend to lean closer to the older pulp hero than the modern superhero, though I try to see how the two can intersect when I can. They've been a real joy to write. 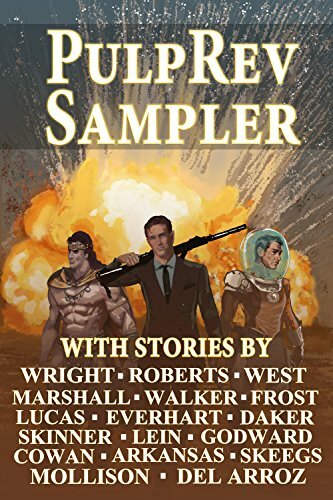 If you're a fan of superheroes, heroes and villains, or pulp heroes then be sure to check these stories out. I'm looking to throw everything I have into making these as fun as possible. For now, check out Paragons when it comes out in early November. If you want to read exciting stories about heroes, and if you're here I can't imagine you don't, then this is for you. After all, who doesn't like a good hero? *My next novel before this is nearing completion and should be out in November. When the final date has been nailed down I will make another post about it. I'm really excited about this one, too, so please look forward to it! And finally we reach the end. Declan Finn's Dragon-nominated Love At First Bite series, part action, adventure, romance, science fiction, fantasy, and horror, and all fun, has reached its conclusion with this release. And what an ending it is. If you haven't been keeping up, the first book set the stage, the second thoroughly blew it out (and up), the third brought out the big(ger) guns, and now the fourth exists to tie it all together with a neat little bow. Or as neat a bow as an author like Declan Finn allows. It can get gloriously messy, in the best of ways. For those not keeping up, the Love At First Bite series stars a psychotic human named Marco and a bloodsucking vampire named Amanda as they progress in their relationship from friends to partners as the world progressively falls apart around them with every book. After fighting everything from vampires to demons to . . . whatever the heck the villain in book three actually was to what is ostensibly the end of the world in book four. The series constantly ramps up as it goes. As an end to the series, it's a suitable final chapter. Each book had slowly grown with scope and ambition leaving few places left for the series to go without devolving into self-parody. But the author avoids that trap by ending it at just the right point when the stakes hit critical mass. You will see carnage and death, and you will see if good really does ever win in this world of horrors. The last encounter is the final statement on all four books and the definitive last period on just what it is all about. I would argue the last few lines of the book sum it up even better, but I'm not going to spoil that. Amanda and Marco have finally admitted how they really feel about each other, but is that enough? Part of the enjoyment in the series besides the supernatural battles is also the deepening of the relationship between the leads which finally comes to a head here. In fact, it might even have a key part in how things turn out. Love is the strongest weapon, after all. 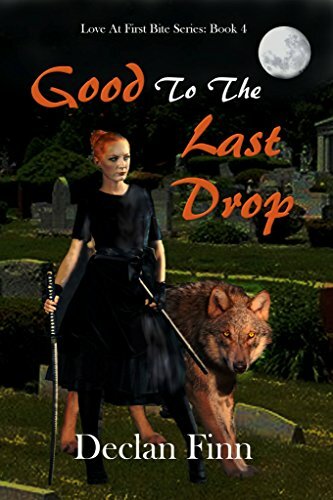 Good to the Last Drop is what it promises. It delivers the goods you've come to expect from the series, and it delivers until the very last line. Several characters are brought to the limit, and not everyone will make it out alive, but that's par for the course in a Horror story. This is a hard review to write because I don't want to give spoilers, but it is also the last book of a quartet, so I'll simply review the series as a whole here. I've always been a fan of classical vampires. The original Dracula by Bram Stoker is one of my favorite Horror tales. But vampires have been de-fanged and watered down over the decades since. They're either generic killing machines or strong humans with pointy teeth and bad complexion. What the Love At First Bite series did was bring the monster closer to the roots laid down by Stoker and has fun with it along the way. This is a messy and intense quartet featuring plenty of horror, action, romance, humor, and even some Fantasy and Science Fiction elements like a garish on the succulent steak that is this series. The Love At First Bite books are stories you might have seen published decades ago when excitement was enough to get publishers to release series like this. Though with how Declan Finn disregards genre boundaries, maybe not. Recently I've taken the plunge into an odd short story (I suppose the official name is "Flash Fiction") collection entitled Hell's Five Minute Tales of Horror by an author named Hell Richards. I assume she has no relation to Richard Hell, the infamous punk musician, but I can't be sure. Full disclosure is two-fold: I got this for free, and I've hated the majority of modern horror I've read. It would be easy to dismiss this as a throwaway collection, or give it an easy rating even if I didn't enjoy what I received. But the truth is also two-fold: I don't change reviews based on the price I paid for the material, and I always review products for what they're trying to be and not what I want them to be. All that out of the way, let's get to it. Well, first I should describe just what this is. 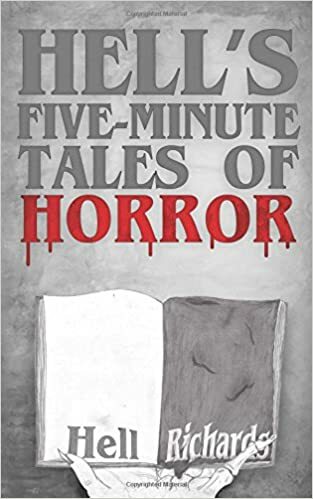 Hell's Five Minute Tales of Horror comprises of just over forty slices of short horror that each take no more and no less than five minutes to read. The subjects vary from obvious horror tropes like serial killers to more ineffable beings to weird twists to legendary monsters and everything in between. 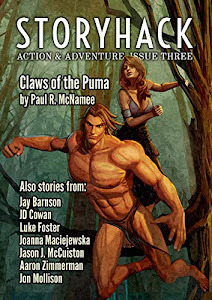 For such short stories they are varied in their subjects, some of which are better than others, but all of which make for good horror experiences. As for my personal thoughts, I enjoyed the stories focused on monsters, indescribable horrors, and weird tale-esque ventures more than the ones involving realistic serial killers. I simply don't find people like this fascinating or interesting in the slightest. Sick people don't make for fun reading unless they are villains begging to be stopped. But they are only one type among many. With a count of just over forty stories there is plenty here to engage. My personal favorite stories of the collection include Wendigo, The Silent, My Monster, Aronaga, I Hate the Cinema, Daruma-san, That's How I Do It, Satoru-kun, Cat Scratch, and Sally in the Woods. It was difficult to choose among so many as so many are just quick and enjoyable enough to hook the reader for five minutes or so. Horror works best in a framework of rules. The reader has to understand why what they're partaking in is creepy and will have trouble being engaged if there's no coherent reason for what is happening. Even Lovecraft's most successful stories, as imaginative as they were, played on the fact that the audience, and the protagonist, didn't know the rules. That was what made them eerie. But nothing happened that would jar or take the reader out of the plot and make them feel cheated. These stories are short enough that no rules get broken, not that I think this author would otherwise, and that's why I can wholeheartedly recommend it to any fan of horror. Just over forty tales is well worth your time and they are all varying degrees of fun. It's also refreshing to not have a modern horror collection that has to sneak in a very clunky moral lesson to ruin the atmosphere and take the reader out of it. These are just what you'd expect--creepy and unsettling stories. This is good old fashion horror, and if that's what you like, I recommend reading Hell's Five Minute Tales of Horror. This is what you've been looking for. This is a bit of an update post, but not in the way you would think. I have a few posts lined up for this month while I finish editing my next novel. Because of how time consuming that can be, I decided to try this small feature out for the month of October. I promise to have more updates on that when I'm able to nail down a definitive release date. This October we're going to be doing something fun. These posts all share the theme of being reviews of horror-related material. These will all be from independent authors, including one you may have seen on this blog more than once before. I've been looking for an excuse to give this reviews more of a highlight than usual, so this will be the perfect opportunity. October is the official month of horror, after all. To give a bit of a preview of what is to come, one of the things I read was Nathan Dabney's version of Phoenix on the Sword by Robert E. Howard. Unfortunately, I've not read as much Howard as I would like, and this story was not among those I have. On the plus side, this made me appreciate Howard's work all the more. Dabney's version is as close to the original text as I could find (it isn't edited like the L. Sprague de Camp editions that I refuse to touch) and includes an afterward the his attempt was preserve Howard's work to its purest essence. Reading through this story, I could definitely appreciate how great a storyteller the creator of Conan really was. As can be assessed by the great cover, this is a Conan story--in fact the first Conan story. 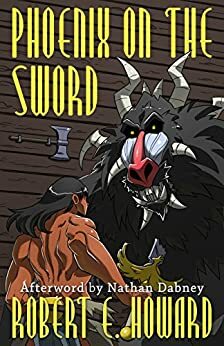 Conan is a king and is dealt a rough hand as he has to deal with both a treacherous plot to usurp him and a hellish beast summoned from another world at the same time. It's a short five chapter story, but it packs in quite a good deal of intrigue and action. Those who know Conan as "the big barbarian guy" might be surprised to see the horror elements at play in this tale. If you have not read this story before, or Conan at all, this is a great place to start. It is a brisk, yet very engaging read, in a packaging that gives the material the attention it absolutely deserves. Next week I'll be taking a look at the work of another independent author, and a strangely unique idea for a book. Until then, keep it creepy!